Garmin has made their long-anticipated next play in the oversaturated fitness watch market. They’ve revamped their Forerunner series with three new models: the Forerunner 230, Forerunner 235, Forerunner 630. As their names suggest, all three watches are optimized for an athletic crowd; the watch’s abilities obviously endear it to runners, but bikers and swimmers will certainly reap the rewards of the updated models. The new models, like the rest of the Forerunner series, are meant for all-day active wear. They offer more specialized readings than most fitness watches, including V02 max readings, predicted race times, and recommended rest periods. Users will be able to track their calorie expenditure, location, and total step count, all of which are fairly standard offerings for a fitness watch. But potential buyers should know that the full suite of readings may require additional purchases. The 230 and 630 only measure heartrate via the DSFA chests strap, eschewing the 235’s (and most other smartwatches’) optical heart-rate sensor. The Forerunner 230 will include that chest strap in its price, while the 630 will not. Another note about Garmin’s optical heart-rate monitor: this is the first time Garmin is pioneering their own version of the technology. While the previous Forerunner 220 had an optical sensor, it was developed in conjunction with Mio. The Forerunner 235 will be entirely Garmin’s creation. Garmin’s models are more expensive than traditional fitness bands, but they also do more. The new Forerunners will have limited, but still impressive, smartwatch functionality. iOS and Android users will see alerts when they receive text messages, incoming calls, and email notifications, and a phone’s music can be controlled through the watch’s interface. Perhaps the most innovative aspect of the Garmin Forerunner series is its ability to change interfaces. 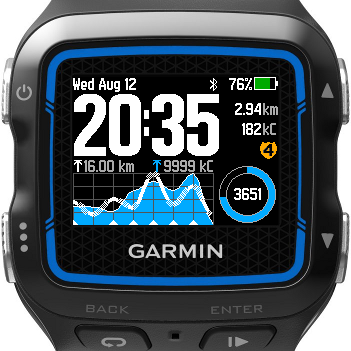 Connect IQ, the Garmin watch app store, allows developers to upload their own apps, widgets, and data fields. Users who want to customize their watch interface can download from a fairly limited, if innovative (there’s a promising ‘find my car’ GPS service), selection of apps. The Forerunner 630 will retail for $400, the Forerunner 235 at $330, and the Forerunner 230 at $250. To sum up: this is a runner’s watch series, with strong tools for other athletic endeavors, and it really makes sense if you’re devoted to improving your running game. If that’s what you want in a watch, then this is a worthwhile purchase; if not, hold off for a less specialized fitness band.